Before gaining control on your instrument, and before even beginning to work for that control, you must first have concepts. These concepts become your goals, your standards while practicing. To work toward either a tiny slender pianissimo or toward a masterfully sustained, forceful fortissimo, you must first conceptualize musical situations that would call for these things. Control means that every note speaks exactly when you want it to. That you can play with accuracy at the softest level to the loudest level in all registers. On long and short notes, between notes that are close together or far apart, with good intonation and the required articulation, without smacking into notes. The real condition of the lip is difficult to judge from day to day. It may feel good, but it has to be proven out. Only by patient, dogged repeating of figures that are awkward (and may look simple) can the various muscles in the cold lip be reawakened, reminded, and brought under satisfactory control while critically listening for forte. You pick up the horn, look at the music, and plan to play it. You observe the time signature and begin to mentally hum the written notes against a rhythm or beat within yourself. You understand the key and perhaps can hear the written pitches. You know the fingerings and you recall playing well yesterday. You understand something about air, embouchure, and support but you sound awful when you start. Perhaps you can’t even play a simple study beautifully. Why? As in ballet, the pretty result seen on stage is nothing more than the total of all the dry, laborious, physical procedures. So many of the mistakes that happen are from some little thing being wrong, a slight exaggeration of any otherwise correct action. It is clear from this that one of the most important aids to playing well is to practice with care and alertness. Good routines, carefully practiced and with great effort not to miss is one of the secrets of playing well. When the sound is bad, and the mind seems to wander, and the flesh doesn’t feel willing, then one must determine to turn such a bad day into a good one. One must proceed as though a concert were to start in thirty minutes, and with an intelligent warm-up make the lips do the work that they have previously proven themselves capable of. Never mind the bad sound and the bad lip sensations. If one proceeds with determination and intelligence to produce the notes of the warm-up routine, the sound will gradually improve as the lips find themselves. Be more impressed by the player who sounds well in the concert after sounding badly in the warm-up than by one who starts out sounding better and deteriorates from there. The slow, separated, and clear striking of notes breaks the careless movements of jaw and mouth muscles down to exact requirements for each note. Everything that the player has learned through the years of experience is relearned during this period. The reason a very experienced player can often warm up more quickly than the beginner is he has repeated this relearning process a countless number of times, and therefore he can relearn all he knows in a matter of minutes. Correct methods will work even on a totally cold lip; i.e., application of correct methods is immediately and always effective. But this does not mean that the correct method can eliminate the need for a warm-up that is slow and careful. Most players need to play slowly and thoughtfully at first each day in order to re-choose the correct methods. Speed comes later. So we must conclude that even finished players (those who have really how to play in correct fashion) must continue to practice to keep in shape. Playing on a cold lip implies thought above the physical. It is important to be able to play a concert on twenty minutes of warm-up. Be warmed up before attempting the extreme high register. Avoid high notes on a cold lip. The process of warming up might be described as that initial period during which the lips are made to respond to a direct and sudden thrust of air from diaphragm support. One note again is like learning to stand. Kopprasch #24 played slowly is like learning to walk. Just being in a place is not the same as getting there. One therefore has to practice the shift between positions. Studies and solos are like running. When warming up, try for the correct angle and diaphragm support. Hand position should be like a ruler (inflexible). Choose a hand position for the quality of sound desired, not for intonation needs. Part of warming up is to change and improve the quality of the lips themselves, which are doing the familiar movements. Make them “fatter”; i.e., fuller, more assured, stronger, more padded feeling, etc. This is done by repeating, by using more air, by more force behind the air, by striving for better range of dynamics and pitch control. Different sets of muscles are educated and toned up daily, some close in, some a little further out. On a bad day, the quality of the muscles is very poor. So the tone and control, and to some extent the accuracy, will suffer. But the warm-up effort should then be to at least educate those muscles that find the notes, ignoring the extras that add tone, control, quick attacks, short notes, etc. The warm-up routine should be more than just a wake up experience for the lips and muscles involved in the use of air. It should be a daily learning (or re-learning) experience that guides the lips to a position, a facial arrangement that enables the lips to play the full range of the instrument. It should also make the necessary demands upon the system of air support. In that sense, the warm-up experience should be teaching or reminding something important to both the lips and the air. Practice patterns based upon the use of “false low notes” are a means of helping the player to discover and develop just such a correct lip arrangement that is capable of playing the entire range with little or no change in lip or jaw position. The idea of using the false low register is not a new one. Some players on all the brass instruments have been aware of the benefits of false low register practice for many years, going well back into the days of the natural instrument. What may be new here are the ideas advanced to explain why developing the false low range helps in the development of the high notes. Possibly new also is the application of these ideas specifically to the horn as their use has become more and more common on the trombone and trumpet. It is not the central purpose of these false range studies to develop a richer and fuller low register (at least not at the outset), just as they are not to be thought of as primarily a method of extending the range of useable low notes. It seems paradoxical that the main purpose of working in the false low range is to aid in the development of the very high notes. When that main purpose is achieved, the player can then practice connecting the high and the low, and can work on the development of technique and rich sound in all registers. The main reason why this learning process must take place in the false low range area lies both in the nature of brass instruments and in the nature of the studies themselves. The idea is that the lips are changed from note to note in scale and chord patterns without the aid of valve changes. This cannot be done within the normal playing range of the instrument. Do not exaggerate the dropping of the jaw, as our object is to teach the lips a position that will remain basically the same for the total register of the instrument without too much jaw movement. Try moving the jaw slightly forward during a low note. Do not try at first to play with a big sound. Premature attempts to produce a big sound in the low register may encourage exaggerated positions of lip and jaw. These somewhat contorted positions, while they may achieve some volume and control in the low register, are altogether different than what is needed in the upper register and work counter to the goal of a position that will work the same for high as well as for low. The very low notes will sound airy and be barely audible at first, possibly with the sound of air escaping. This is natural, to be expected at first, and occurs mainly because the mouthpiece is barely attached to the lips. 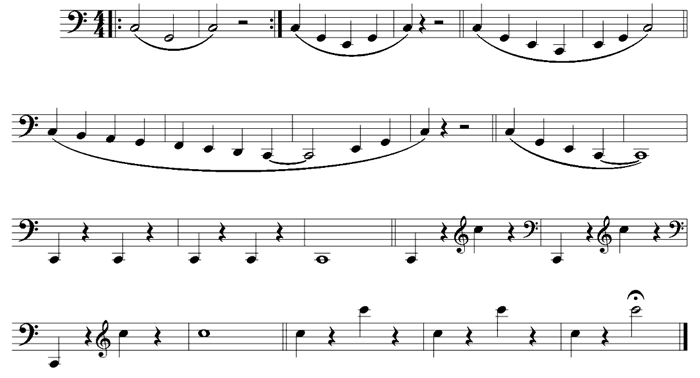 True sound begins to appear as the mouthpiece and lips start to form a seal, and the air enters the horn instead of escaping around the mouthpiece. The patterns are written with legato, but there is no reason not to play them attacked occasionally. Mouthpiece and lip arrangement. These two things are influenced and improved by practice in the false low range, and one of the reasons for doing such practice. However, to start the process, it is suggested that you arrange lip and mouthpiece about as you would for a g' to c' and try to keep the same arrangement in descending. Keep both lips in the mouthpiece; i.e., keep the lips near each other (somewhat as in saying the letter M). As you attempt to play a low note in this position (without consciously dropping the jaw) the air stream will gently push the lips toward the mouthpiece and you will find yourself gradually producing a very quiet version of the note you are thinking. The lips gradually learn to assume and hold this position. Do not turn the lips in for the high notes but try to produce those notes by retaining as much as you can of what you were doing lower. Keep the lips slightly opened out, hold firm to form a cushion around the opening, and blow with a good air stream. The purpose of these studies is to help you find a lip arrangement which functions in a basically similar way over the entire range of the instrument and which, in addition, extends the usable high range as well greatly increasing endurance. As the exercises to be practiced extend well below the ordinary written range of the instrument, it is necessary to get used to reading in the bass clef and the ledge lines below the staff. The bass clef notation used here is the so-called new notation, in which the notes sound a fifth lower than the written notes. Here is further explanation of false notes. The purpose of doing the low false notes is to draw the lips out as a beneficial exercise in a search to develop a good lip position for the high notes. As such, the player is advised not to play them loudly or with a real sound. They are truly false notes. The mouthpiece is barely touching the lips, air leaks out, and you have little feeling of control over the notes, especially at first. The lips project slightly. They turn out slightly as the air blows through toward the horn. They begin to form the cushion arrangement that is sometimes referred to by players who have achieved a good lip position. This cushioned arrangement with the lips slightly turned toward the mouthpiece, slightly puckered (and supported unconsciously by the corners), is then held in place as you attack a note in the upper register. That is why many of the patterns jump from the false notes to a note two octaves higher. The false notes act as the teacher to set the lips in a good position, and the position is held (more or less) for a distant note. Good brass playing can result only when the lips are doing what they should, when the air is being used as it should be used, and when these two main ingredients are working well together. Although it can be added that once the player is using both elements properly, it then seems as though the whole secret of playing lies in simply blowing well. In other words in using the air stream properly. Exercise 1: All F horn, open horn, no valves. Repeat the same pattern going down in half steps (i.e., 2nd valve only, then 1, 1+2, 2+3, 1+3, and finally 1+2+3 for F#). Exercise 2: Again, all F horn, open horn, no valves. Repeat the pattern going down in half steps. Exercise 3: Play each section several times, working downward from the low c to G. You can also practice the first and second section chromatically, but always without help from the valves. In the third section, stay on the F horn on the upper notes. In the fourth section, alternate between F and B-flat horn. Repeat the pattern going down in half steps. Once you have gotten the knack of how to produce these lower notes, you can choose to reduce practice time by starting out with this similar series, which works chromatically toward the upper register at the same time that it extends the lower notes. In any event, success in reaching the extreme high notes will be directly related to the results gained in extending the lower register. The first three exercises deliberately ignore the notes between low c and f#' and do not go above c''. The next series focuses on further extension of the lower “false range” and work upward from c'' into the extreme high register. This procedure ignores the two octaves between c and c''. The extreme high and the extreme low are then connected during what can still be considered as a first phase of daily practice, by scales and arpeggios, which include all the notes on the instrument. This first phase is a method of warm-up and of disciplined practice, which can be used by beginners as well as advanced players. The second phase of practice should consist of etudes, solos, excerpts, etc., according to the needs of the particular player. The first phase of practice can in no way be considered to be a substitute for the second phase of practice. The nonuse of valves of the first phase is that in doing it resolves (or avoids) all kinds of lip and breathing problems.